This section explains how and when Facebook displays OneStream branding to you and viewers on Groups & Pages. 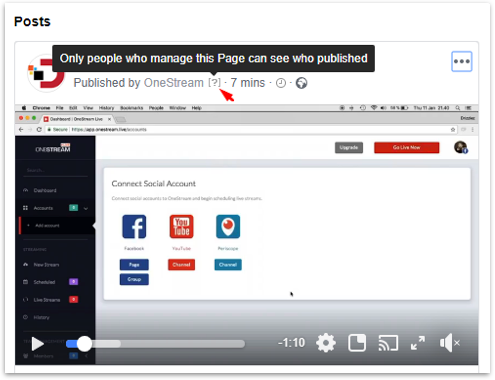 For Groups & Pages admins & editors: OneStream tag is always shown by Facebook, so everyone is aware how the streamed was published. For viewers: No OneStream branding or tag is shown, except when event notification is used on Facebook Groups. On Facebook Groups, your viewers will see OneStream tag next to your post ONLY when event notification is used. Otherwise, no OneStream branding is shown. In order to avoid OneStream branding completely on groups, there are two options. Schedule a stream to go live in less than 15 minutes. 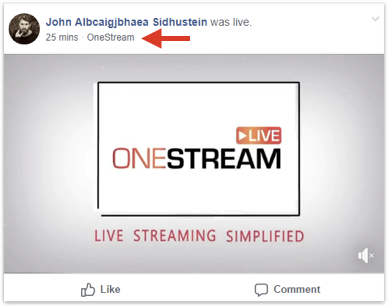 If a stream is set to go live within the next 15 minutes no notification is sent to Facebook and therefore; OneStream tag will not be shown in the Facebook group. Example: If the time now is 17:00, you must schedule your stream to go live before 17:15. Schedule a stream and select no announcement from the event notification drop down menu under advanced settings. The default value is 15 minutes. When you select no announcement, no prior notification will be sent to the group. If you want to send a notification to a Facebook group beforehand then OneStream tag will always be visible on the post. Unfortunately this is controlled by Facebook and cannot be changed. On Facebook pages, you can see “Published by OneStream” next to your post. This OneStream branding is added by Facebook and is visible only to Page Admins/Editors. OneStream branding on Facebook pages is not visible to normal viewers. This can be confirmed by hovering your mouse over the question mark symbol next to “Published by OneStream” tag.